Make Curry Dressing. Cook and drain peas as directed on bag. Rinse with cold water; drain. Place shrimp, celery and peas in medium bowl. Add dressing; toss to coat. Cover and refrigerate at least 2 hours to blend flavors. Just before serving, gently stir shoestring potatoes and cashews into shrimp mixture. Arrange endive leaves, pointed ends out, around edge of medium serving platter or 4 plates. Spoon shrimp mixture into center of platter or divide among 4 plates. Sprinkle with additional cashews and shoestring potatoes if desired. Chow mein noodles can be used instead of shoestring potatoes. 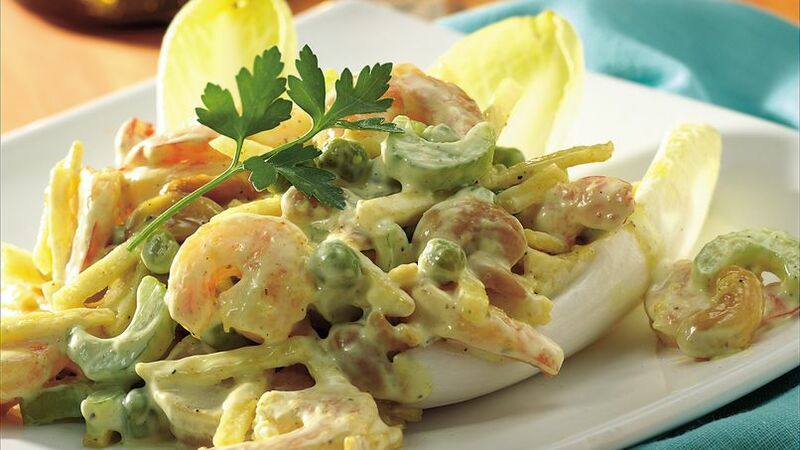 The shrimp mixture can be made up to 24 hours ahead of time; add cashews and potatoes just before serving. Also, the endive leaves can be separated, washed, wrapped in a damp paper towel and stored in a plastic bag up to 24 hours before serving. You may find several types of curry powder in your grocery store, but the most common blends are labeled either curry powder (mild) or Madras curry powder (a bit hotter).